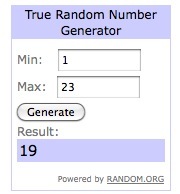 First Things First-- the winner of the PhotoVision DVDS-chosen by random.org is....... Rachel- of The Rachel Way- comment #19 was the first of her bonus entries for participating in PMM! Congrats Rachel! I will get the DVD's to you. And since tomorrow is packing day for our big move, when I saw Shell's Rockin the Bump-- I knew this would be the perfect quick post for me today. How far along would you guess I was in this picture? About to pop? I was only 27 weeks! Though Ryder was born 5 weeks later--so well I guess in some ways I was ready to pop- I just never ever would have guessed it at the time. And what did this belly produce? Time sure does go too fast. If you never saw it-you can see the video I made to celebrate his first year here. So head over to Shell's-any time this week and share how you rocked the bump! AHHHHHHH! I can't believe I won!!!! Yippee! I've never won a giveaway before! Thanks Em! I'm so excited!!! And the bump-no one rocks it like you!! You're bump is SO CUTE! Only 27 weeks though?! Wow! Congratulations Rachel!!! And as for you Emmy, what an adorable pregnant girl you make! That's the cutest picture ever!! Wow, I seriously covet those boots! You might be the cutest pregnant person ever. Oh you were so rockin' it! Love the boots. And the photo collage of your baby! Adorable! And look at those fabulous boots! Look at you! Hot mama!! You were carry quite low for carrying both a boy and being only 27 weeks. I guess you were about to pop! That dress is beyond cute! You were definitely rocking the bump, adorable. And I love the month shots of your son. Great idea! That came out so cute! And yeah, you did look like you were about to pop! I played too. Your bump is cute! It's just a bump. A baby bump. Aw, I love your baby bump and the year series. Too fun. Oh my! Look at that bump...I would have never guessed you were only 27 weeks in that picture...it is such a cute bump though...all out in front! & I love the monthly pictures of your son! Adorable! All front tummy. :-) So cute! Happy moving. Yes, I actually did think you were near to poppin'! You look adorable! Way to rock it! LOVE that baby bump! And that is the cutest month by month collage EVER! I'm now 3 months behind on it!!! I wish I'd started that with Jack when he was born---SOOOOOOOOO cute! You are adorable! Our babies are only 4 days apart. 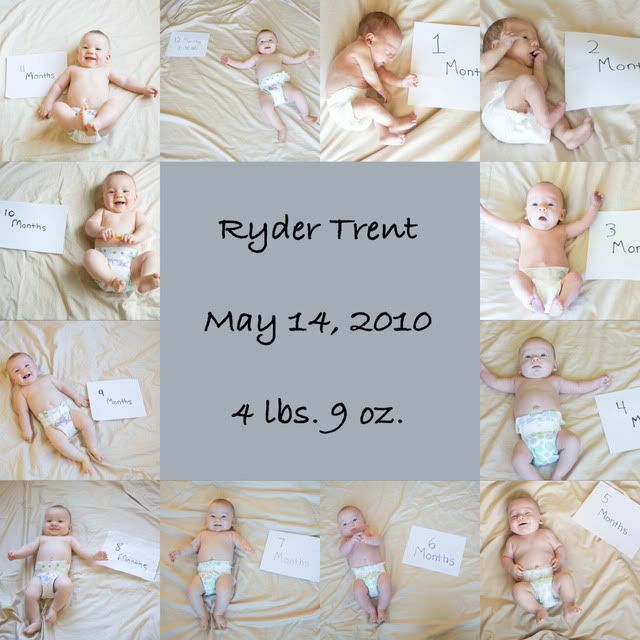 My youngest was 5/18/10 and I also made a video for his first year! Great minds think alike! What a cute pic! And cute dress too! you were so stinking cute! I have to hate you a little. Does it make you want to be preggers again? I'd love to be pregnant again, but not totally sure I want any more babies. Maybe I'll just get fat. Look at you! You're so adorable in that photo! Love how you rocked that bump! You were adorable then and adorable now, not much about you isn't! I love this picture of you just as much as the first time I saw it! I would never have guessed 27 weeks for that picture. Those pictures are beautiful! I love the boots! You are so skinny except for your bump. And your bump produced such an adorable little munchkin.